Celebrating Lunar New Year often means feasts of abundance. In today's world that we are living in, perhaps, what is more important is the togetherness that this period could bring to every household. Make your way down to Folklore at Destination Singapore Beach Road, and enjoy a warm and homely reunion affair by Chef Damian D’Silva. Have a taste of what it means by heritage - not just about the age-old recipes handed over from Chef Damian's maternal Paranakan family but how each dish is being cooked with fond memories and skills that chef has brought with him since young, by helping out his grandmother and mother in the kitchen months ahead of the celebratory feast. Every table, including yours, should have this “Do-It-Yourself” Popiah Set ($60). 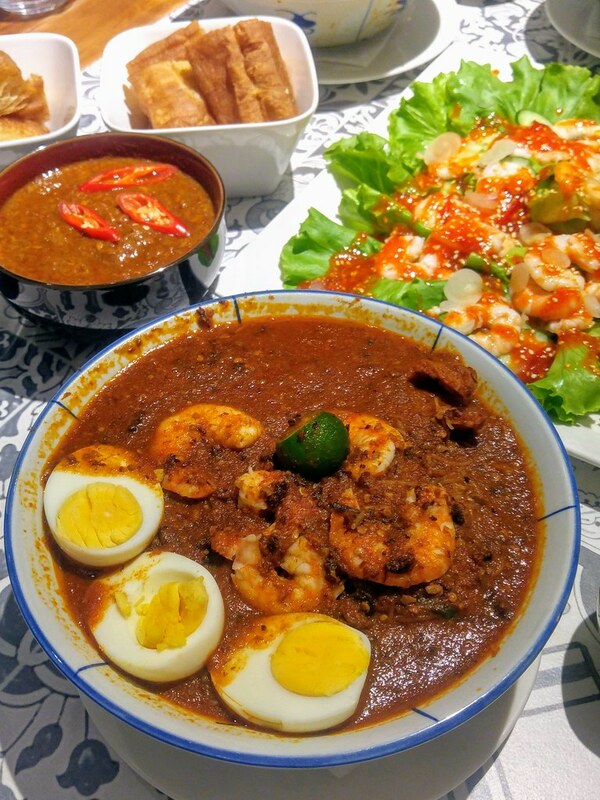 Takeaway is available at $321 nett for minimum of 20 pax order, good for 4 pax. Rolling the popiah together really enliven the mood and how often do you get the chance to make it together? The popiah filling is not something that you could get in the market. It may look somewhat the same but what you will get is hand-shredded turnip, bamboo shoot and pork belly cooked in prawn and pork stock. The ingredients are not thrown and cooked together in one shot but prepared and cooked down individually to develop their flavours before mixing them together. Cooked with preserved soya bean paste, the filling may look heavy and rich but it simply delivered a balance of savouriness and sweetness. 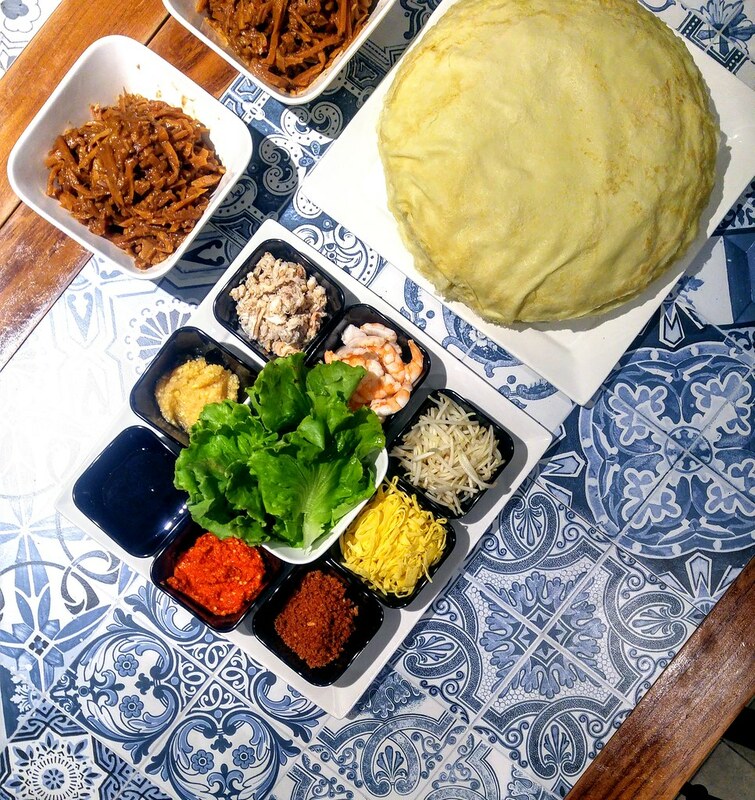 Accompanying the filling is an array of condiments like the minced and fried garlic, chilli paste, sweet flour sauce, shredded egg, crabmeat and prawn, as well as ten large house-made popiah skins. The popiah skin is made fresh daily and you can see just how moist each is when served. Unlike the usual, this skin is soft and light with egg, but I would prefer a plain popiah skin to deliver the flavours wrapped within without adding on to it. I love the succulent crunch and sweetness that the prawns brought to the filling. A must-have dish at Chef Damian's home during Chinese New Year, representing wealth and luck is this Peranakan Prawn Salad ($20). 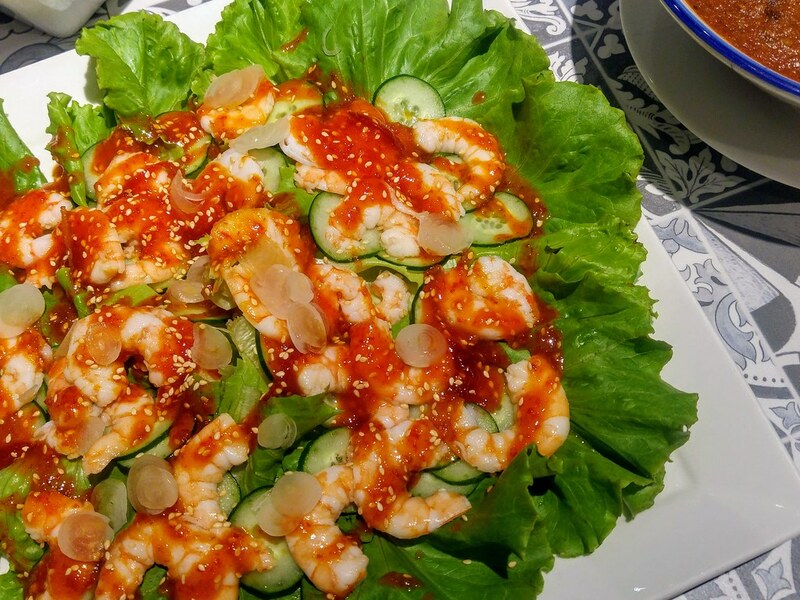 It is an appetiser featuring poached prawns topped on a bed of cucumber slices and fresh Chinese lettuce leaves. What is unique is the chilli plum sauce drizzled atop, along with lime juice. The salad has all the refreshing elements, akin to a Thai mango or papaya salad but the thick chilli plum sauce tends to coat the ingredients like what happened when you overdose your Yu Sheng with Plum sauce, which could get a little overwhelmingly sweet and spicy at the same time. If you like dishes such as Penang Laksa, Garang Assam with You Tiao ($34) will up the pleasure exponentially. A dish enjoyed on the second day of Chinese New Year in Chef Damian’s family, this spicy and sour Peranakan dish is wholesome with red snapper fillet, served with crispy you tiao. A laborious dish, I would say. Rempah titek is made up of dry chillies, shallots, shrimp paste, candlenuts, turmeric, galangal, bruised lemongrass, fried till cooked, then add water and boil till thickened, before adding in tamarind pulp and water. And finally, in goes the red emperor snapper fillet. 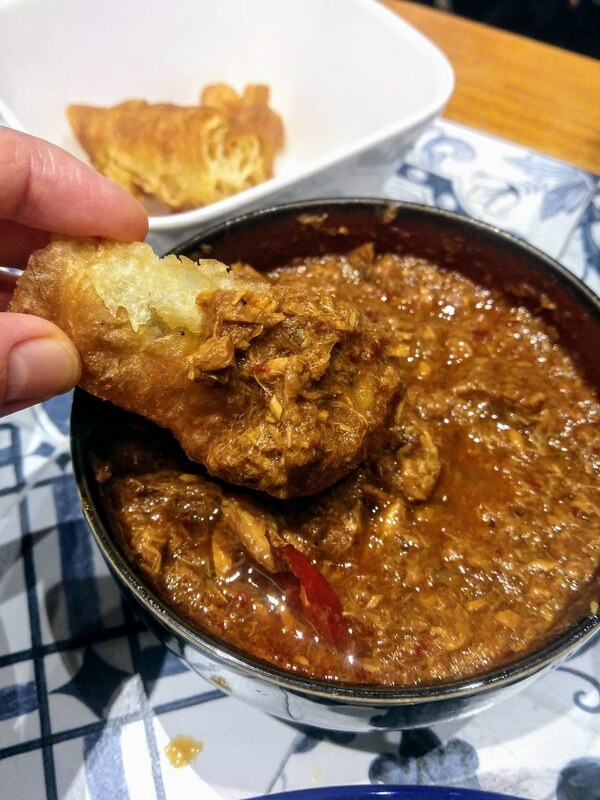 To dip the You Tiao in and savour the gravy that it has sop up is the closest you can get to Chef Damian's memory. He has enjoyed his the same way too, as his grandma would visit the market in the morning to purchase freshly fried dough fritters to complement the rich, piquant gravy. It is a dish that makes you salivate just thinking about it. Well, if dough fritters are too rich, a bowl of rice is always good! 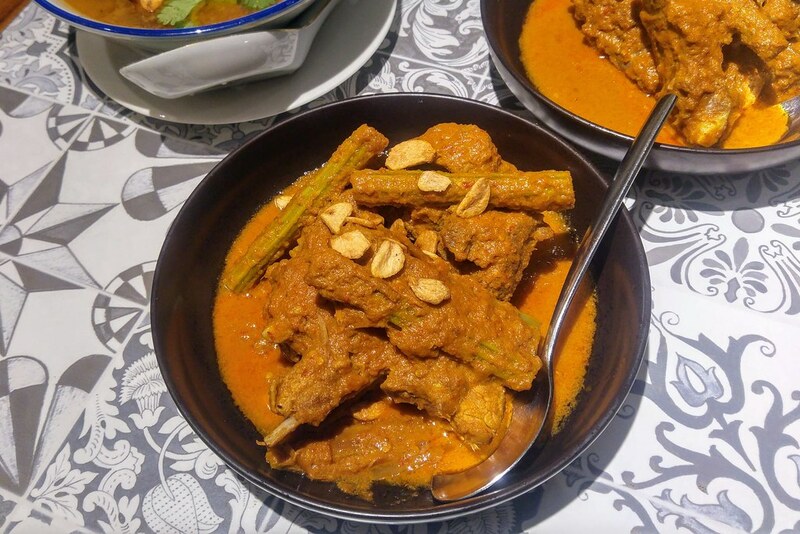 In Sayur Kailo with Pork Ribs ($32), get acquainted with this vegetable which called itself drumstick. Due to the shape of its pod, this harvested gourd from the Moringa Tree features a thick long bean pod and serves well as an accompaniment to dishes with thick sauce or gravy, as the pod takes on fully the flavours of the base sauces. Its tough exterior reminds me of an old lady's finger which the exterior has grown to tough to be eaten but the interior still remains pulpy. To eat it, you would have to would bite into a section of the cooked pod, then pull it out of your mouth to extract the soft flesh. I had mine this way and it was like indulging in a decadent bone marrow. I'm not a fan of pork curry but these tender ribs were better than expected. 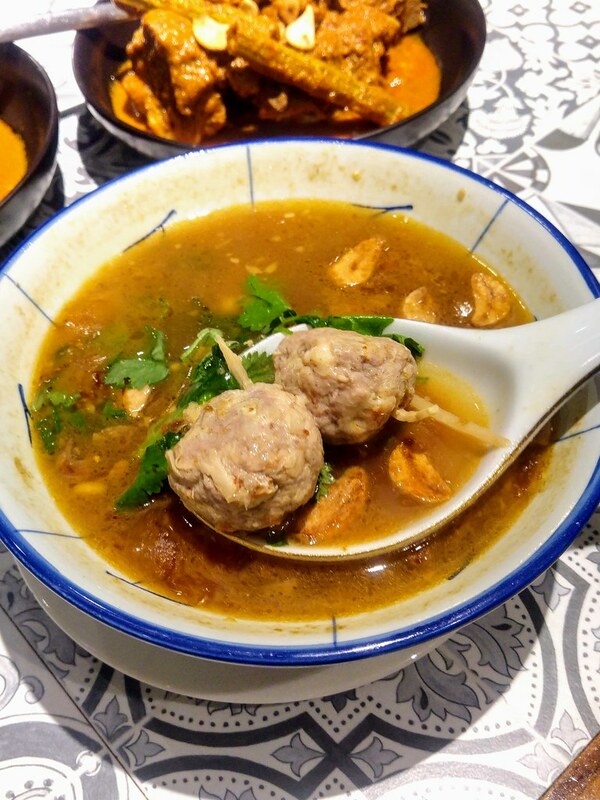 Peranakan cuisine is just not about curries and spices, as seen in Bakwan Kepiting ($20), a crab meatballs soup cooked in a prawn and pork stock. Minced pork is mixed with chopped prawns, bamboo shoots, soya sauce and "beaten" to a desired consistency, followed by crabmeat and spring onions. The meatball paste is shaped into balls and then steamed before adding to the soup to be cooked. It is a dish suitable for the spring festival, as bamboo shoots is essentially a spring produce which is added to the soup, adding on to the significance as a festive dish. 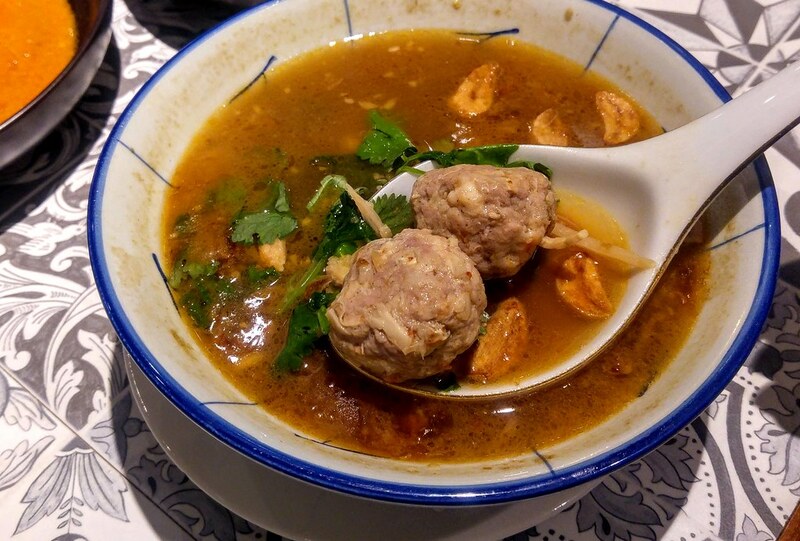 The meatballs were compact but at the same time loose with bamboo shoots as fillers, which flavour the meatballs with sweetness and crunch. Peranakan Mee Siam ($16) is a classic staple in a Paranakan household and Chef Damian’s mee siam paste is a complex blend of onions, chillies, shallots and candlenuts. This is a drier version compared to those that we are familiar with. The vermicelli is fried with the paste, together with the thick broth that is slow-cooked with fermented bean paste, dried shrimps, prawn broth and then finished off with lime juice. No assam is added, instead lime juice and sugar are used to impart the sour and sweet notes. If you find assam too assertive, this might live up to your expectations. And the eggs, were exceptionally fluffy! 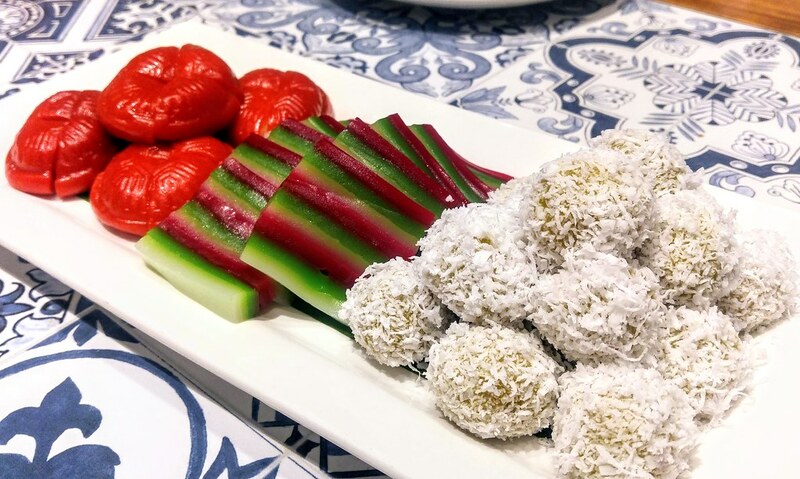 For dessert, share a plate of Kueh Platter featuring chef's daily selection of handmade kuehs, a showcase of traditional Peranakan desserts. What we had were Ondeh Ondeh, Ang Ku Kueh with peanut and mung bean paste fillings, Kueh Lapis Sagu as well as one of the highlights of the evening - Kueh Kosui. I was told this is the best and I couldn't agree more the moment I took a bite of it. 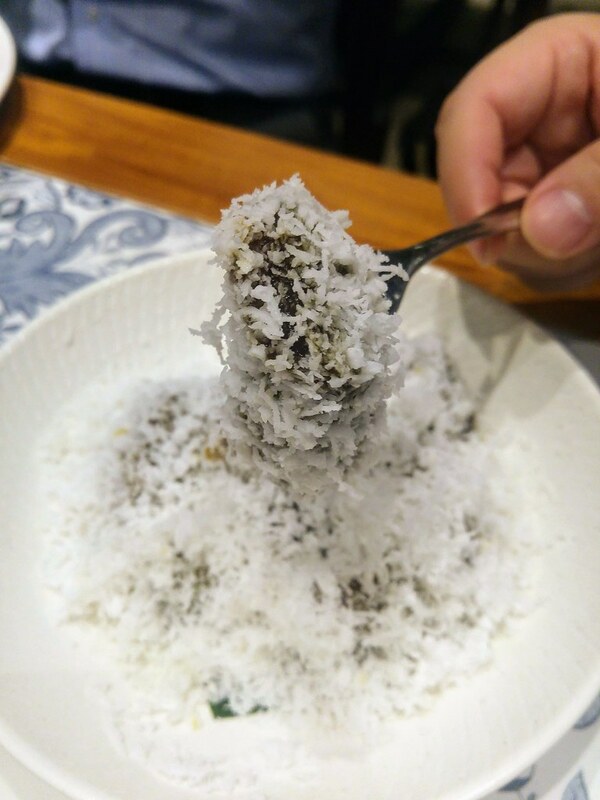 Made using genuine Gula Melaka, which chef has sourced it himself, this Kueh Kosui came with a well rounded sweetness and the fresh grated coconut just made it even more sublime as the kueh slowly melted in my mouth. Finding authentic heritage food these days are challenging. More often than not, even if they claimed to be made with good old recipes, they are products of central kitchens. At Folklore, you and your loved ones will experience a rare authenticity and the essence of a simple but hearty reunion meal. Folklore's Chinese New Year menu will be available for lunch and dinner from 4 to 19 February 2019. Festive meal takeaways are available with an advance booking of 5 working days from 30 January to 19 February.